I often get bored with the "vegetable side". Oftentimes, weeknight meals at our house need to be quick. That usually allows for a steamed vegetable tossed with butter. YAWN. Last Sunday, I was in charge of dinner. We had broccoli planned for the week's menu. Ugh. Broccoli tossed with butter again?! YAWN. So I tried something new! We have tossed greens with lemon and garlic before...and cheese is always great with broccoli. And I wanted it very low maintenance. So I roasted the broccoli with lots of olive oil. I love when the oven does the work. Give it a try tonight. This makes 4 small side portions. Double for a family of 5+ or a really hungry family of four. Preheat oven to 400˚. Move rack to the upper middle of the oven. Line a baking sheet with tinfoil. Layer the broccoli on the baking sheet. Drizzle with olive oil and toss with your hands until all is well coated. Sprinkle with salt, pepper and garlic. Toss again. Layer evenly again. Roast in the oven for about 10-15 minutes. Things will be starting to get tender and begin to brown on edges. 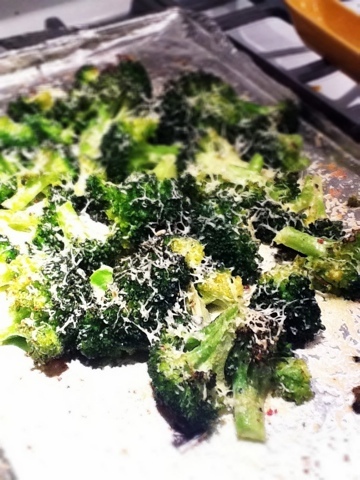 Take sheet out and sprinkle with Parmesan cheese evenly over broccoli. Roast for about 10 more minutes, or until cheese is melted and starting to brown on edges. Take out of the oven and squeeze the half lemon over broccoli, drizzling juice evenly. Serve warm.